Welcoming a newborn is certainly the greatest joy of life, it could not be otherwise. It is also true, that happiness is accompanied by a considerable dose of apprehension that ends up saturating the lives of all new parents struggling with the first cries. Also in this case, the technology is made available to the user who, with a baby monitor, between one diaper and another, can enjoy quiet moments, while keeping his baby under control even from a distance. Before talking about money it is useful to summarize what are the main types of baby monitors currently on the market and the key functions that could guide the choice. If you prefer the Ferber method to deal with the nocturnal awakenings of your little one, a simple intercom could be a real life-saver when, in the middle of the night, you will experience some mild sleep from the deep sleep phase (or less) wailing coming from the room next to yours. For the more technological ones, associating an audio device with a micro-camera could make the difference. So which baby monitors should you choose? Audio surveillance : these devices provide only audio monitoring, allowing the parent to hear everything that happens inside the room of the offspring. Within this group of devices, some offer the possibility of interacting directly with the child (to calm him or rebuke him) through a walkie-talkie style communication system (with performance changes related to coverage, audio quality and interference management, employees from the price ranges). Audio and video surveillance : these devices, clearly more sophisticated, give parents the opportunity to control their children at any time in their ” independent ” life. All this is allowed by the presence of a camera (of variable size and performance according to the price range) positioned inside the baby monitor in the child’s bedroom, able to stream to the device (tablet or smartphone) in the hands of the parent. Once this first substantial distinction has been made, we can move on to the analysis of the salient structural and functional characteristics of a baby monitor. Also in this case, it is important to premise that, as with all technological devices, the price ranges mark the degree of complexity of a baby monitor. On the basis of this we can, with good security, assert that audio-only baby monitors are slightly cheaper than audio-video units, which obviously depends on their lower technological complexity. Remote communication : the parent will be able to use the baby monitor as an intercom. Very useful to avoid indulging too much in some small whim or to reassure the child at a distance. Sensors and detection LED : the latest generation devices incorporate sensors and LEDs capable of detecting suspicious noises inside the room, respiratory movements (in particular, particular they can detect their absence for a prolonged period of time), noise intensity and status of child agitation. Infrared vision : function of the baby monitor video only, useful for the visual control of the child even in the dark. Lights and lullabies : the newer (and medium-high end) baby monitors integrate interesting extra features. These include the presence of ” spy ” lights (of various shapes and colors) to reassure children suffering from nycophobia. In the same way, it is possible to find, in some models, a wide selection of lullabies useful for the autonomous falling asleep of the child. Phonebook for emergency calls : in a rather surprising way, some devices have an internal memory dedicated to creating a personalized phonebook. Very useful if you need to make emergency calls. Detection and temperature management of the home environment : some of the high-end baby monitors offer the possibility of managing temperature and humidity levels in the baby’s room. Taking pictures and recording videos : another interesting feature that could satisfy especially parents who do not want to miss even a second of their children’s first moments (and even super social parents). As it can be guessed, choosing the most suitable baby monitor may not be so simple. In addition to the functionalities, the technical features of the device must be taken into account. What in particular? Signal range : fundamental to evaluate in order to receive the signal coming from the unit in the child’s room in a clear manner. For this purpose, it will be necessary to consider the presence of physical obstacles to transmission, distance (coverage, other fundamental parameter) and location of the device inside the room that could affect the signal range. Coverage : expressed in the section dedicated to technical specifications, in meters (between 50 and 150 meters), it is also influenced by walls and obstacles placed between the two devices. Channels : like modern radios, the most sophisticated baby monitors have different audio channels to tune in to minimize the physiological interference. All in order to make reception clearer. Connectivity : the new-generation audio-video monitors require the display of images on smartphones and tablets. For this, they use Wi-Fi connectivity to the home network. And then again, you will have to decide whether to settle for a single unit intended for parents, or if you prefer to buy a baby monitor that consists of several devices for surveillance. It could be a good idea to distribute multiple monitors within the home environment so that you can move around freely at home. In the same way, it will be necessary to assess which dimensions are best suited to your needs (space, handling and to adequately display any videos). Last but not least, the construction materials. In this case, more than anywhere else, it is essential that the baby monitor meets certified construction standards and is constructed with non-toxic and possibly anti-allergic materials. 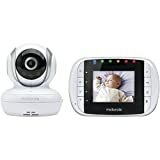 1 Infant Optics DXR-8 Pan/Tilt/Zoom 3.5" Video Baby Monitor with Interchangeable Optical lens 29,041 Reviews $165.99 See Offers! 2 VTech DM111 Audio Baby Monitor with up to 1,000 ft of Range, 5-Level Sound Indicator, Digitized... 3,548 Reviews $24.95 $18.59 See Offers! 3 VTech DM221 Audio Baby Monitor with up to 1,000 ft of Range, Vibrating Sound-Alert, Talk Back... 5,787 Reviews $39.95 $36.19 See Offers! 4 Video Baby Monitor with Digital Camera, ANMEATE Digital 2.4Ghz Wireless Video Monitor with... 442 Reviews $129.99 $75.99 See Offers! 5 Video Baby Monitor with Camera and Audio | Keep Babies Safe with Night Vision, Talk Back, Room... 56 Reviews $79.99 See Offers! 6 【2019 New Version】Campark Video Baby Monitor with Camera Infant Digital Cam Optics with Infrared... 73 Reviews $49.99 See Offers! 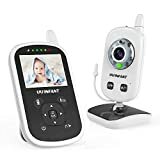 7 Video Baby Monitor with Camera and Audio | Keep Babies Safe with Night Vision, Talk Back, Room... 99 Reviews $69.99 See Offers! 8 Nanit Smart Baby Monitor and Wall Mount - Camera with HD Video & Audio - Sleep Tracking - Night... 170 Reviews $249.00 $194.00 See Offers! 9 Babysense Video Baby Monitor with Infrared Night Vision, Two Way Talk Back, Room Temperature,... 2,401 Reviews $126.65 $75.99 See Offers! 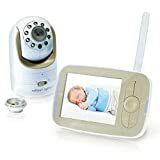 10 Baby Monitor with Remote Pan-Tilt-Zoom Camera and 3.2'' LCD Screen, Infrared Night Vision,... 204 Reviews $89.99 See Offers! Not only that, there are several other brands that have entered the baby monitor market for a relatively short time but that have proposed extremely technological devices. 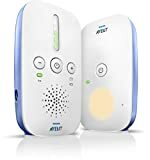 The highly exclusive audio version, Philips AVENT DECT Baby Monitor, is also very competitive, with a much lower price but with more than sufficient performance. 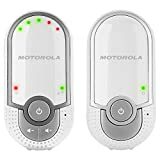 Motorola also produced a series of interesting baby monitors, including MBP33S (audio-video monitors) and MBP11 (audio only).